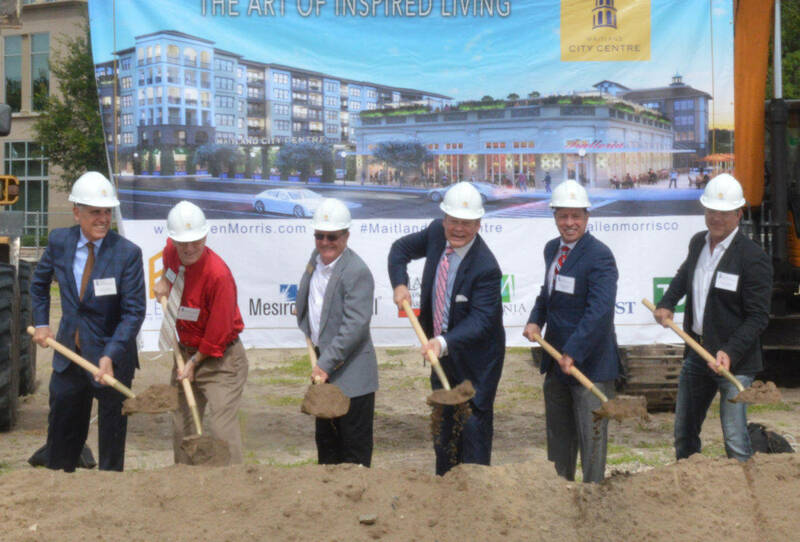 The Allen Morris Company, one of the largest diversified real estate firms in the southeast, has broken ground on Maitland City Centre, the first true urban, live/work community and destination in the Orlando suburb of Maitland, Florida. When complete, Maitland City Centre will offer approximately 35,000 square feet of prime rentable retail and restaurant space within a six-story building that encompasses a three-acre full city block with bustling sidewalks, trendy dining venues, high-end retail establishments and everyday conveniences making the project not only a lifestyle, but also a destination. The groundbreaking ceremony marked the start of construction on the US$68 million mixed-use project, a joint venture between The Allen Morris Company, Lamm & Company Partners and Millenia Partners, financed by SunTrust and TD Bank. The company also announced the retail tenants that have so far committed to join Maitland City Centre, securing more than 50 percent of its retail, when completed in approximately 20 months. Maitland Mayor A. Dale McDonald, City Council members, top city officials and numerous other dignitaries were in attendance to celebrate this project milestone. Maitland City Centre’s tenants to-date include Starbucks, Subway, Renaissance Med Spa (which will offer a complete menu of pampering spa services), as well as Nava Pets. The development team is also excited to announce commitments from Chef Clayton Miller, (Dove-Cote, Orlando), and his much anticipated restaurant and artisan Food Hall/Market, Mesa 21 (an authentic Mexican restaurant and tequila bar) as well as Doc B’s Fresh Kitchen (a fresh casual American fare and cocktail bar). Located at the crossroads of Maitland’s City Hall and the bustling, new pedestrian-friendly Festival Street, the project is poised to be a premier metropolitan and family-friendly oasis as well as central hub for people to live, work and play. Maitland City Centre’s Mission-style architecture inspired by City Hall and the Cultural Corridor will be comprised of 220 one- and two-bedroom stylish rental apartments and 24 live/work units, seamlessly fusing contemporary design and refined elegance throughout and complemented by resort-like amenities. The residences will feature gourmet kitchens, granite countertops, stainless steel appliances as well as lushly landscaped terraces and range from 700 to 1,300 square feet units priced from approximately $1,300 to $2,400 per month. Maitland City Centre will create a sense of place where everyone from millennials, to families and empty nesters can enjoy a true urban lifestyle where they can live, work and fully thrive while celebrating Maitland’s history and community. Slated for completion in 2018, Maitland City Centre marks The Allen Morris Company’s 82nd development. Millenia Partners is a full service commercial real estate and development firm that advises its clients in leasing, development, asset management and investment sales of retail & office properties. With seven offices throughout Florida, Georgia and Texas, Millenia is one of the fastest growing commercial real estate companies in the Southeast. Its current leasing, management and development portfolio is valued at nearly $200 million dollars. Millenia’s team has over 175 years of experience with $1 billion dollars in transactions. For more information, please visit www.Millenia-Partners.com.